Valtteri Bottas (4th, 1:43.570): "FP1 was better than FP2 because I think we were missing a bit of pace in the second session compared to Ferrari and Red Bull. It was quite difficult to get a lap together, even my best lap today was a bit a messy. It's not an easy car to drive at the moment, we have some work to do with the balance. But if we get everything right, the car is quick. We have plenty of things to look at tonight so that we make the right changes for tomorrow and Sunday. The fact that we're here in Baku earlier than in previous years definitely affects the tyres, but the biggest concern is the wind. It's supposed to be very windy tomorrow and on Sunday which makes a lot of a difference on a street circuit." Lewis Hamilton (5th, 1:43.603): "It's been a smooth day. We got through everything we needed without many mistakes and we gathered lots of information. It started out quite warm but cooled down in the afternoon, which made it interesting to try and understand the tyres in both conditions. Overall, we weren't quick enough today, both Red Bull and Ferrari seem to be ahead of us at the moment. So we've got some work to do. I'm going to be knocking on the doors of all the engineers overnight, so that we can hopefully make the right changes." James Allison, Technical Director: "It was a day of learning at this very unusual track. But even though we've made progress, we've got a lot more to do tonight in order to be able to take the fight to a very fast Red Bull. But we have plenty of directions to head in; I'm looking forward to the remainder of the weekend, which we're sure is going to be a competitive one." Daniel Ricciardo (1st, 1:42.795): "I was very happy today. With a street circuit you need confidence in yourself and in the car. The car was well behaved and didn't take any confidence away from me. There was a good relationship with myself and the car so we will build on that tomorrow. I think we can still find a little bit more but generally I was happy and I think it's going to be quite a close battle tomorrow and Sunday. The car feels really strong through the castle section in the second sector and I felt comfortable and confident there. It's a very tight part of the circuit but that's the place that I felt most comfortable and the RB14 felt strong. I'm sure the others will turn it up a bit in Qualifying and gain in sectors one and three but sector two will be the key for us. The step in grip between the tyre compounds is pretty consistent and fairly linear so no real surprises there. I do remember last year on the Friday both our cars were very quick and we didn't quite have the same pace in Qualifying, so I'm not going to play it up or anything, but this was all we could ask for today. It is encouraging even if we don't qualify on the front row tomorrow as I think the race car will be very strong. We are still in the group of favourites." Max Verstappen (3rd, 1:42.911): "Pretty decent day overall, the car is fast so I'm happy about that, though obviously not happy about the incident in FP1, it was a bit windy and I lost the rear, spun and hit the wall but my mechanics did a really good job repairing the car and luckily it didn't really affect us too much. We pretty much ran to the programme and the car in second practice was very competitive. We were good on both tyre compounds so I'm pretty happy with that. We look quick but of course you always want to improve. Kimi is quick and for sure tomorrow Sebastian will be there, so we still need to improve but it was a good day. We also know that in Qualifying Mercedes have this power mode so they will be quicker but on the other hand, our car was handling well and when you start to feel more and more comfortable in the car you can usually gain three or four tenths on a track like this, so hopefully it will be the same tomorrow. As for the end of the second session I think we just had a faulty sensor issue so no concerns." Esteban Ocon (7th, 1:43.814): "I think we are in good shape. It's been a solid day working our way through the job list and improving the car. There is more speed to find tonight and tomorrow, but we have done our homework. I've been building my confidence during the day – which you have to do on a street circuit – and we have the potential for a strong weekend. The track conditions didn't really improve as much as I was expecting today. It was still quite dusty and slippery this evening and it was pretty low grip in the cooler conditions." Sergio Perez (12th, 1:44.142): "It's been a positive day and I think it's going to be a very interesting weekend. It's a track I really enjoy and with any street circuit it's all about finding the limits and pushing them as much as you can. The fight in the middle of the grid is going to be very close, but I think we can be competitive. The work we have done today gives me encouragement and I have a good feeling with the car. The main priority tomorrow is to make sure we deliver a perfect qualifying session so we can be high up the grid for the race. The track conditions at the end of the day saw the temperatures drop quite a lot and that's why we saw drivers making mistakes and running wide. It's going to be tricky during qualifying tomorrow." Otmar Szafnauer, Chief Operating Officer: "It's been an encouraging day of practice allowing us to achieve most of our objectives. The first session was basically an aero testing session with both cars trying some development parts. All the data we collected will help us learn more about the car's behaviour and where we can find more performance going forward. The second session was routine with a mixture of qualifying and race preparations. It's clear that the margins between the midfield teams are very small, but the early indications suggest both our cars have a good opportunity to qualify inside the top ten tomorrow." Lance Stroll (14th, 1:44.459): "I have great memories from here in Baku, and I am not going to lie, it was a little emotional walking back in the paddock. It was a tricky day for everyone. We saw a lot of lock-ups and a lot of yellow flags. There was a lot of traffic out there, as expected, but it was still a positive day in many ways. We are still not where we want to be. At the same time, we saw some improvement in FP1 and then in FP2 we dropped back a little bit, but it is still much better than where we were over the last few events. I think there is still a lot more to come, so we will see tomorrow what the others do and where we are in the field." Sergey Sirotkin (17th, 1:45.007): "There's a very big contrast between the beginning of the day and the end. FP1 was positive with the work we did and the information we collected. It was good to have both cars in the top 10, so that was a good start to the day. We were less lucky in FP2. I was a bit limited with the amount of tyres I had, because I had just one qualifying tyre and the rest were used primes, so that didn't help me get the best from the low-fuel performance runs. The high-fuel runs were very messy with the traffic. I did a couple of clean laps, but I don't think we got the best numbers for the life of the tyre, and for the wear, and overheating. That's a bit of a shame because it started very well in the morning, but this session was one of the worst so I'm quite disappointed with that." Paddy Lowe, Chief Technical Officer: "What we set out to do was achieved today. It looks to be the normal close competition, so we'll be working very hard tonight to make sense of all of the data from testing today, to try and find some extra tenths which could make a very big difference in terms of the qualifying order. We also need to remember that what we really need is a good race car, as it's relatively easy to overtake here, so race pace is paramount." Carlos Sainz (8th, 1:43.834): "This morning was a challenging session. We were trying to understand some new parts on a very green track and braking got tricky at times. But we understood everything quite quickly and completed our run plan in FP2 without issues and with better performance. There is still margin to improve so we'll work hard to get there." Nico Hulkenberg (10th, 1:44.091): "It was a pretty standard Friday for us. This morning I had a nasty front lock up that happened very suddenly and cost us a run and a half, but the afternoon was fine. Now it's about chasing the balance and optimising the car. We are getting there with everything and will look to further improve overnight." Nick Chester, Technical Director: "This morning we got into our normal programme with some aero work, trying to get the drivers settled in with the new low-medium downforce package we are running here for the first time. We didn't get as much done as we wanted as both drivers flat spotted the tyres; the track here is so low grip at the start of the weekend and we saw lots of other drivers doing the same thing. They missed out on a few laps, but the second session was pretty good. We got everything done and the short runs were decent. The long runs looked encouraging, particularly for Nico. We will pull everything apart tonight with all the tyre info and look forward to tomorrow." Pierre Gasly (15th, 1:44.712): "The first day in Baku – it's a street circuit so it's quite challenging. It was pretty tricky on my side because we only had four or five good laps in FP1. We had a couple of issues, so I didn't run much but I'm pretty happy with the car as we ended the session P9. It was a good beginning to the weekend even with the track being very dirty. The track then improved in the afternoon but I struggled a bit more. We're fighting with the balance and the grip and at the moment it doesn't feel so great. We have some work to do tonight to try and understand how we can improve. It's so tight between everyone in the midfield, so we'll have to give it all in FP3 to be ready and get a good result in Qualifying tomorrow." Brendon Hartley (18th, 1:45.051): "Today was a pretty clean day! It was a new track for me and I had some good fun learning it. I feel like I got up to speed very quickly and I very much enjoyed driving the Baku City Circuit. At some times we looked promising - we were in and around the top 10 - but at the end of the day we were towards the rear end of the field. We have some time to find, which means we'll be working hard tonight to extract the extra tenths out of the car that we need to hopefully make it a few places up the grid." Jonathan Eddolls, Chief Race Engineer: "This track has quite different requirements compared to the ones that we've been to before, mainly aerodynamically with a straight of 2km, so we brought some new aero components suitable for the circuit. This morning it was very dirty, dusty and generally had very low grip so it made it very difficult to get the lap time early on. Actually, you could see the problems were for all drivers with many finding it easy to lock the fronts and go off. In addition to the difficult conditions, we had a couple of issues on Pierre's car. His power unit required a few minor changes and we also tried some different aerodynamic tests. These minor setbacks didn't allow us to get the best out of his FP1 session which, unfortunately, at a street circuit like this was quite a compromise for him. On the other side of the garage, Brendon had a clean day. We managed to get some mechanical tests completed in FP1, which allowed us to make some further aerodynamic changes going into FP2. The track temperature also came down so we had to look to re-optimise where the tyres were working. FP2 went pretty much to plan with no significant issues other than the pace isn't where we expected it to be - particularly in the long runs. This means there's quite a bit of work to go through tonight to look to understand how we can improve for tomorrow, as we think we should be a little bit further up on the time sheet. A tow is very important around this track, there's four or five tenths to be gained at least out of the last corner, some cars got those on their quickest laps but our laps were set without a tow. It's quite difficult to engineer a tow in qualifying, but something to consider. There's plenty for us to look at tonight." 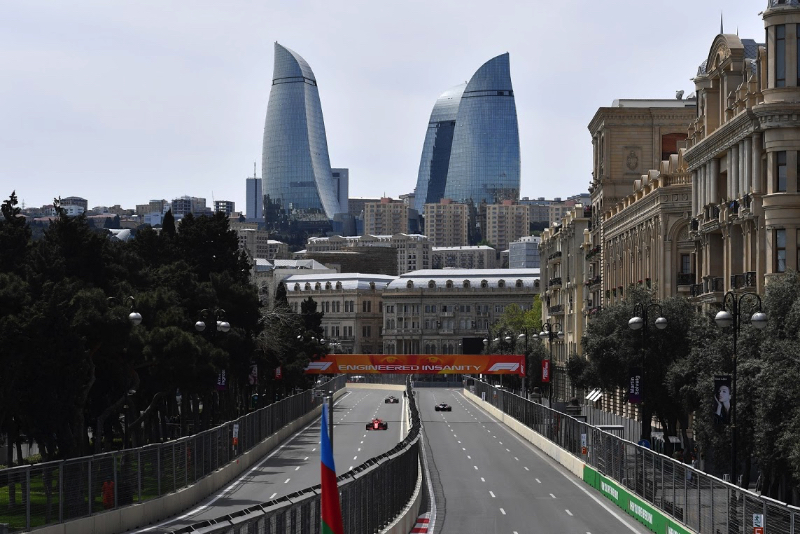 Toyoharu Tanabe, Honda F1 Technical Director: "Like all street circuits, the Baku track is a bit green and dirty on a Friday, but the situation improved throughout the two sessions. In the morning, Pierre had to spend a bit more time than expected in the garage as we had to make some minor adjustments to his PU. Apart from that, it was a trouble-free day for us and we managed to work through almost all the PU programme." Kevin Magnussen (9th, 1:43.977): "It's been an interesting day. There was a big difference in car behavior between FP1 and FP2. We made a good step between the two sessions. I was much happier with the car in FP2. Hopefully, we can carry that into tomorrow. It looks like it's going to be a lot windier on Saturday, so once again the track's going to change. We'll try and hit the target and adapt to that if those are the conditions." Romain Grosjean (13th, 1:44.425): "It was a pretty good day. We've learned quite a bit. It's been interesting to find out the right aero level, and finding the right top speed against the others. There are a few things we can do to get better. It seems that a small thing here can make a big difference on the time sheets. I'm confident we're going to get on top of it for tomorrow. I feel good in the car – there are just a few things we need to adapt, and tomorrow should be a better day in terms of lap times. The feeling is good." Guenther Steiner, Team Principal: "It was a good day of work. We were looking for the right low- and high-speed aero setup. In FP1, we were a little bit off, but in FP2 it seemed that we were going in the right direction. We now need to get the graining of the tires under control. All in all, a good day of work, and we're looking forward to tomorrow." Fernando Alonso (6th, 1:43.700): "Ours was a comfortable car to drive today – that's always important on a street circuit, where you have to attack the corners and feel confident in the car. Today, we had a that car performed well in all three sectors, each of which is fairly unique. This weekend's updates were introduced in order to help deal with the circuit's characteristics, and seem to be working as we expected. It feels like we've found a little bit of speed compared to the last few races, so I'm fairly happy, as we weren't compromised in either the corners or the slow speed sector. I was also a little lucky on my fast lap, running behind Nico [Hulkenberg] as he began his quick-lap, so I gained a couple of tenths in the final sector. It's going to be as tough as ever to make it into Q3 tomorrow, but this is actually one of those races where you don't really know if starting ninth or 10th is actually better than starting 11th or 12th, and getting a free choice of fresh tyre." Stoffel Vandoorne (19th, 1:45.288): "It's been a positive day: we tried a few new bits on the car, so our main focus was on understanding and exploiting them. There's a lot of learning still to be done, and a lot of improvements still to be made, but I think the progress we made today shows we are headed in the right direction. From my side, it feels much better than it looks on the time-sheets. We didn't get a proper run on the Ultrasoft tyre, encountering some traffic, and I had a little brush against the wall, too, so I wasn't able to improve over the time I set on the Supersoft. There's definitely more to come. Hopefully, we can put all the pieces together and have a positive result tomorrow." Eric Boullier, Racing Director: "We've been testing a number of components on the car during today's sessions, carefully back-to-backing them, running with flow-vis paint, and cross-checking data with our engineers both at the racetrack and back at the factory. It's a little too early to accurately determine what sort of benefits they bring, but, clearly, any improvement we can add to the car will be a bonus. Today's running showed us once again that the Baku City Circuit is unforgiving, the traffic relentless, and that threading your way to a quick-lap is no easy feat. And if the rest of the weekend follows the same course as today, we could be in for another eventful and unpredictable weekend. As we've shown at all three races this year, our race team is sharp, reactive, and well-set to capitalise on the misfortunes of others. If we can add a reasonably competitive car into the mix, we could be set for a positive weekend." Charles Leclerc (16th, 1:44.940): "It was an ok day overall. We had two quite positive sessions. Our race pace looks good, and we still have a bit of work to do in preparation for tomorrow's qualifying. It is generally an interesting track in terms of tyre management. Given the possibility of a change in weather for the next two days it may become even more interesting. I look forward to being back in the car." Marcus Ericsson (20th, 1:46.047): "It was not the best Friday for me. FP1 was good, but then in FP2 we had to cut the session short due to a problem we had on the car. Unfortunately, I was only able to complete a few laps during my first run. It is a bit disappointing because it looks like there is good potential there for us. On the positive side, we were in the mix with the midfield during FP1. We should be able to bounce back tomorrow and have a stronger day."